First Appearance: X-Men (vol. 2) #17 (Feb. 1993): "Waiting for the Ripening"
Kwannon was a Japanese assassin known by the codename "Revanche." Her mind was switched with the mind of the British superheroine Psylocke, who was a member of the X-Men at the time. For a time, Psylocke's mind was merged with Kwannon's. This confusing situation was finally resolved when Kwannon died within Psylocke's body. 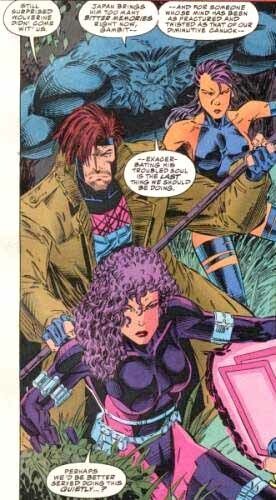 The consciousness and soul of Psylocke (Betsy Braddock) remained permanently within Kwannon's Japanese body. X-Men (vol. 2) #18 (Mar. 1993): "The Crops Mature"